Made it to Lord Cardigan today. Albert Park was a buzz with people going out for breakfast. The weather was a little better than last week, though still a miserable summer’s day for Melbourne. Lord Cardigan is a quaint place, small, nice ambience, and friendly staff. As I was walking in, I noticed a couple of breakfasts on plates, and they looked pretty good. I had a look at the menu, and noticed it was a little more diverse than Cumulus Inc. This was promising. I guess Lord Cardigan is aimed at more the breakfast crowd, where as Cumulus would be directed towards the business crowd looking for breakfast. 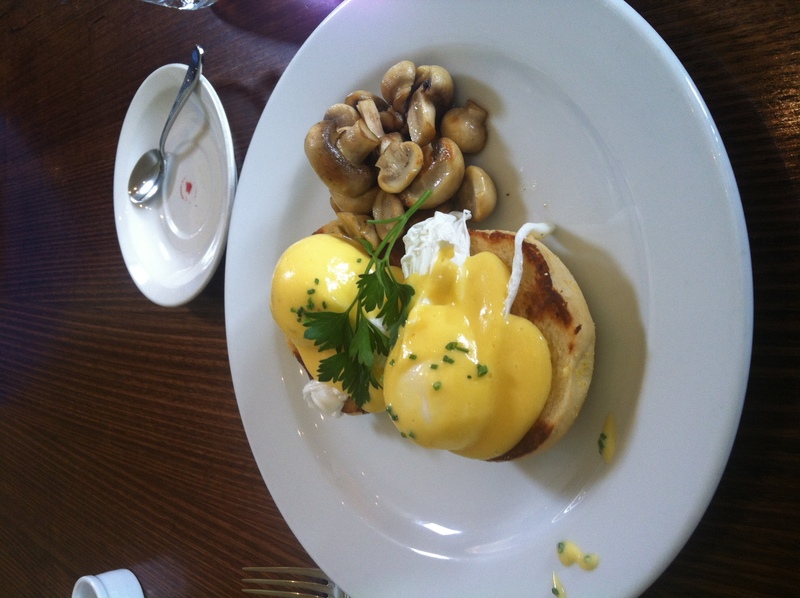 I ordered an Eggs Benedict without ham but with mushroom. I saw this on someone else’s table and it looked good. A good hollandaise sauce is a sign of a good breakfast spot. The hollandaise was quite good on this dish. Against my better judgement, I ordered a latte as well. The coffee was from Italcaffe, and have never actually come across this brand before. Why against my better judgement ? I was planning to go out for a coffee somewhere after this, and didn’t want to “coffee” myself out ! The latte was not very potent on the nose, but the taste was strong. A dark roast, with the color matched taste. Strong well “cooked” coffee. Though this seemed to bring out the flavors a little better. Eggs Benedict, without ham ? The eggs benedict had a small twist, it was served on corn fritters , which added a little sweetness and a good complexity to the dish. It was very nice, though the mushrooms were a fraction underdone, as I prefer them cooked a little more, but that is my preference. The way that these were cooked preserved many of the characteristics of the mushroom. Obviously cooking it more will mean that it will lose the natural taste. They were simple button mushrooms. At Cardigan I was not rushed. I liked this aspect of the breakfast experience. Whether you are on your own, or enjoying another’s company, you tended to be left alone, not hassled by waiters asking you questions like would you like another coffee with a look of ” if your finished buzz off !”. Good quality food and good quality service. The total experience was good. I rated this at a 6.8. It was a very similar experience to Cumulus, similar quality, service, and coffee, though not great, better then average. Though I have to say, the Cumulus Shaksouka was great. Can’t really top that. « Cumulus Inc, 45 Flinders lane.